Built from sturdy 24 gauge 18/8 stainless steel, this standard weight full size steam table pan features double reinforced corners that add strength where the pan takes the most abuse. Ideal for use in hot and cold tables at your catering event or buffet, this impact-resistant pan makes cleaning and refilling a breeze. Easy to use and available at a great value, this anti-jam stainless steel pan is a dependable addition to any kitchen! After using the same old "big pans" for a long time, we decided to try some new ones. These clean up much easier and the food does not stick at all. Great quality steam pans. We were worried these would not be durable but they are surprisingly heavy duty and definitely worth the purchase price. Will buy again. I ordered these same pans countless times and am never disappointed. I love the anti jam pans as it's a time saver for sure. Thanks. It is very spacious for a party and very practical with whatever food you make inside. I have put a variety of food inside I I love how much fits in them. Wonderful pans, The 2 extras we keep on stand by to for extra meals to serve in for our After School Tutorial, and we also use these for our Feeding Program. These are a nice, lightweight hotel pan that is good for the tasks we used to use disposable pans for. We keep water in these pans and use them in our smokers to keep a more humid environment. Heavier pans do not allow the same amount of water vapor to be released as these lighter gauge pans. Very light and good quality. I recommend for the price I have had mine for a year and no dents. I do recommend to buy. Perfect and I have not seen a better value available in the market for a similar product. I have been buying this pans for 4 years on a regular basis and will continue to do so as needed. These Choice pans have been great. We have been using them for several years now and not a single complaint. Make sure you buy the anti jam pans! Every restaurant needs hotel pans. It really depends on exactly what you're looking for in a pan, but these are perfect for NY operation's needs. These pans are very sturdy and work well for baking and warming some of our meat product. We can easily keep these pans in the hot hold unit and serve hot racks of ribs and briskets throughout the day. It is a must for a barbecue place! These pans come in handy for so much more! I love these pans. They are a great value and are very sturdy. I have used them over and over to dye yarns and rovings as well as cook. I have 3 for yarns and rovings and 1 for food. You can'y go wrong with these. Great value for the price. We see these at our local restaurant supply for 50% more money! We have been using our for years and have not had a single dent. We love that these 4" pans are easy to get apart when stacked. They are sturdy and work great from freezer to oven, to Cater Gator and then serving. Couldn't have asked for a more sturdy, perfectly size, pan for our concession stand to use. We have to put all our cooked food in the warmers until they are due to be served and these trays are just what we needed. Thanks again, Webstaurant! GREAT product for a great price. These are lighter weight than I have purchased in the past, but hold up well. Easy to clean and great overall! We use these to keep our cooked hotdogs in. Very sturdy construction and easy to clean also. It is not cheaply made. We are satisfied with it. I dont know why people buy the more expensive comparable products. These economy pans are plenty sturdy and look every bit as nice as those costing 30-40% more. Will be adding more to our collection as needed. You really can't have too many of these. They clean up well, and are easy to pull apart when stacked together. Make sure to get lids that go with them. Solid choice for a hotel pan. Will not hold up to stove top braises but is great for marinating, curing, storing and serving in or out of a chaffing dish. This is a really nice pan, very sturdy and will last for home use a long time. I actually got it to bake french loaves in and it is the perfect size. This stainless steel pan has handled tons of wear and tear daily in our restaurant. Easy to clean, hasn't dented at all, and is very affordable. You can even you use it under your heat lamp to keep food warm as well. We use these every day. They are durable and easy to clean and work well in the freezer, refrigerator, or warmer. They stack great when not using. Great pricing and easy ordering! Bought for use in a commercial hot bar. These pans hold up well to repeated use, cleaning and abuse. The Anti-Jam design is a nice feature seeing as how we have many of these pans. Easy Clean up. We cook a lot of large casseroles and these are the perfect size. They wash easy and do not stick. A plus product. These are sturdy pans that can hold a lot of food! They are easy to clean. We use these pans with our Avantco W50 12" x 20" Full Size Electric Countertop Food Warmer and it's perfect. These pans are great and the price can't be beat. I use these to make baked apple pie filling and once it's done I don't even transfer it to a different container. It goes right to cooling and because it's shallow it cools in less than an hour. These stainless steel table pans or line pans as we call them, hold up well and keep our food hot and are easy to split up different food items. This is a must have item for anybody working any kind of food or catering event. I would highly recommend this product and others like it to anybody. This is a must for any kitchen. Everyone needs a set, especially if you have chafers. There are very easy to clean and last a long time. I use them not only for cooked food, but for prep as well. We use this shorter size on our taco cart for veggie tacos or fajitas so that they can get switched out regularly. They aren't really deep enough for your most popular items, though. These pans are deep and are able to hold enough food to feed a large size crowd. There is no need to keep refilling them. They are strong and durable and i have no dents in them from the heat of the oven or from falling. You can also use them to freeze your food. These steam table pans are wonderful. We use them for lettuce on the salad bar, marinating meats in the walk in cooler, and for pot roast on the hot food bar. They fit well and look nice. The Choice full size standrad weight anti-jam stainless steel steam table hotel pan-4" deep are just what I needed. I ordered a few of these as we usr them all the time. I will buy more in the future. This is a workhorse in our establishment. It is a fantastic way to be able to keep foods organized, have food stored safely as well. These full size steam pans are great. We use them in the countertop warmers and they work perfectly. Will keep things warm for hours. Can be put in the dishwasher for easy clean up. Great pan for our back of house needs and for full service catering orders. Excellent price and it holds up well with constant use and constant cleaning. The full size 4" deep pans are good quality pans and versatile. They are are not as thick on the edges as other brands I have used in the past. This is a Pretty deep one so I use this to water-bath flan and pudding, etc. If working with hard water, you might find that it gets watermark over time but that does not affect the performance of it. The Choice full sized standard weight anti-jam stainless steel steam four inch deep hotel pans are no joke. The strength and durability continue to impress me. I have seen them be dropped numerous time and left in the freezer for several months and still the pan looks as it did the day it arrived. I would recommend them to anyone. Perfect size, and good thickness this pan is obviously a pretty basic unit, but the price was really great, and it shipped to me much sooner than expected. Much cheaper than my local restaurant supply store, I will for sure buy all of my pans from here going forward. Fits well in my Cator Gator I bought here as well, though with the lid on it, it wont let the door close fully. Pretty straight forward, but yeah, I would recommend. These pans are called standard, but come in at a lower gauge stainless than most pans. Great for storage, but use caution when baking in them. A great buy for the price! Needed desperately so we could expand steam table offerings and make extra for frozen Meals on Wheels meals. Seems to have non-stop surface so don't use spray as much. These pans were at a great price point and they work great and hold up extremely well to the day in day out wear and tear of a high volume restaurant. As our business has grown, we have had to add to our stock of metal pans. We use these 4in deep pans with our food prep as well as deliveries. They fit perfectly in our wells and food pan carriers, and have a nice presentation for our events. Would highly recommend. Can't go wrong with these stainless steel pans, great for storing in prep tables, storing produce or pizza cheese. I have a few that i cook sausage, veggies and also lasagna in. I actually used this to put my oil in to fry stuff last night and it was great! It fit perfect in my food trailer! This quality and cost is the best in the business. The 4" pan worked as well as the others I put them up against. I have some pans at the location I work private events at that may be pre 1980's. They are slightly thicker walled than the new ones but I'm happy with what I got with my recent order. This is a great product because we are able to make a lot of food in one dish and still have left over for the next day!! The full size 4" deep steam pan is my go to for water baths for my larger cheesecakes. They are the perfect size for the 8" or 10" without the whole pan being too heavy when the hot water is added. Thicker than aluminum tray but scratches and stains easily with soft fingernails. Must handle tray carefully. Will easily wear and tear. Doesn't look seem high quality stainless steal and has a dull shine. Pan is lightweight, functional and sturdy. I wish steam pans were available in 3 inch depths. Using it to have pie on ice, this item is not made for that but it's works fine for small period of time, like 2-4 hours. Sturdy pans at a much better price than I could find locally. Cleans very easily and can air dry nicely as you can stack them at an angle on top of each other. Awesome Pans, Durable and easy to clean, Best of all they fit right into our under Griddle Refrigeration. Will buy again when I need more. Very pleased with pans, highly recommend. We use the deep pans when prepping for BBQ. Very sturdy pan to put the racks of ribs in after coming off the smoker. This pan is a great size for large items. It will hold many racks of ribs or a lot of half chickens. Very easy to wash. These are well made hotel pans and we use them often. The stainless steel makes it very easy to clean and the nest together great to save on storage space. I have come to rely on my Choice Full Size Stainless Steel pans. These are easy to clean and show no signs of wear and tear after over a year of repeated use. You can't beat these pans for the price. They are a very good quality and they don't get stuck together when they are stacked together. This is your standard hotel pan. This product is sturdy, and arrived exactly as described. We will continue to buy this product as needed, highly recommended! These pans are wonderful! I am so thankful that I took the leap and decided to give them a shot. Perfect depth for my dyeing needs and I don't have to worry about not being able to fit enough yarn/fiber into them. They are extremely sturdy and clean out very easy. Choice brand stainless steel pans are a lighter gauge metal but do the trick. They are more of a matte finish and not that shiny stainless. These pans are great for their intended purpose. I was getting tired of spending money on disposable pans being sent to off-site locations where the clients offered to wash reusable pans and return them. These were worth the investment. WE have been using these to store scrambled eggs and they have really held heat well. Would recommend these for use to anyone for sure. Great Full Size Hotel Pans that are built well and are easy to use in the steam table or for a warmer. These are NSF approved and very simple to clean but very economical. Going for the anti jam is a must. Anyone who gets a hotel pan wet and puts another hotel pan in it is dooming themselves to an hour of trying to tear those beasts apart. This is a great pan at a great price perfect for large family meals. The quality is great lightweight and easy to carry. These pans will stack and save cabinet space for easy access. This is a perfect fit for the steam table. We started out with one and now need more because they are nice size and more useful than one would think. These are the most used pans in my restaurant. Very well made and bargained price. Clean up easily and stack nicely for storage. They're the perfect size for keeping hot dinner items ready to serve. We ordered couple different sized of Choice steam table pans for Web. This is perfect size for cooking our lunch specials. Very solid and constructed. These hotel pans are a great deal for their cost! they are very sturdy and do not bend or warp easily. They also keep their nice appearance after many uses. Great bank for you buck here! These anti jam hotel pans hold up to heavy items and keep heat well. Great for a steam table or holding prepared foods in the fridge. I am so glad Webstaurant offers an alternative to Vollrath. These pans are exceptional. We will be using the disposable steam pans in them to avoid having to dish wash so often. I ordered one of these Full Size Standard Weight Anti-Jam Stainless Steel Hotel Pans to go with my Advantco W50 12" x 20" Electric Countertop Food Warmer. It fits perfectly and it has held up well after several uses. I would highly recommend! You can't beat the price on these steam table pans, and the quality is very good. A little lighter weight than my old ones, but they hold the heat well, clean well and do not jam when stacked. Fits metal chafer perfectly and paired up nicely with the roll top chafer cover I also purchased. A corner of one of the pans was a little dinged up so put that on the back side of table. Used 1/2 pans in one of them and a full pan in the other with smaller loaf pans to sample more products. Would recommend and will buy again. I am glad these pans do not stick together. I have had problems getting other brands apart and so far have not had that problem with these. Nice to get in different sizes for your chef base or steam table. These pans can be used for a multitude of things, but they do work great. Prep or cooking, and even storage. We use them for everything. These pans are a very good quality, durable and very easy to clean. They are a very good price and well worth it, these pots can be used for a lot of things. Great full size pans for the price. Very sturdy and high quality materials. Quality matches the big brands but the price is much more reasonable. Perfect for hot holding or use as roasting pans. This pan is great quality and holds up under a lot of heavy use. It's easy to clean, is a good value, and is a perfect size. Good buy! Can not beat the price. I was worried it would be flimsy/dent easily but the steel is durable and strong. Definitely worth the purchase and will buy again. Simply Amazing we will be ordering more of these. Sturdy and well built, the price is great as well. We definitely needed to order these for our business and we are glad that we did. This came in right on time and the delivery was fast and with out any issues what so ever. We will be ordering more. The selection was great and we took our time doing quality research, the products are the best and the pricing is as well. The stainless steel steam table/hotel pan works perfectly to hold trays of food, to keep heat in our steam table while waiting for smaller pans, and it is easy to clean and store. Love this pan. So easy to clean and stacks nicely for storage. Works great in the steam table for larger items or keeping baked potatoes hot. Great price for such a high quality pan. Highly recommend! I just started a catering business and these pans are great for Lasagna and Chicken masala any dish. very well built durable and will not stick together. Bought these to go with the (4) Avantco W50 12" x 20" Electric Countertop Food Warmers. It has held up to regular busy kitchen abuse. It's just the right depth for the warmers. Investing little by little until I have enough of these. I also bought the pan liners to go with them to help me make clean-up go smoother. We are very happy with these hotel pans. A couple pans were damaged in shipping, but Webstaurant took care of it immediately-Customer service was excellent. Solidly built and has been put to the test!! Hot cold dripped and washed many times still holds up to everything! Get more then you think be these things are great! These pans are not a heavy duty as i had expected but why do perform the function without flaw and will last for the use I will be using them for. Full Size Standard anit-jam hotel pans are just as wonderful as expected. They are light weight but still strong enough to hold hot and cold products. They are sometimes filled with ice and used to keep sides of coleslaw and p/c of salad dressings at a safe temperature in our hot kitchen. The is a great pan... we purchased these for use with the Avancto W50, and they work beautifully. They are easy to clean, are of decent weight, and the top edges are smoothed enough that they do not cause cuts when handling the pans. I recommend this pan without hesitation. 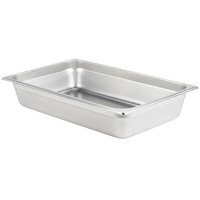 These are a standard quality substitute for a heavy gauge Vollrath steam table pan. They are slightly thinner than the Vollrath pans, but if you are looking to save some money, look no further. These are a great replacement. These pans are a good value from Webstaurant. There are more expensive, name-brand pans that you can buy and they may be heavier gauge steel and be more durable (ie last longer, not dent or bend as easy when dropped on floor), but for our operation, these work just fine. They stack, don't stick, and are sized properly. Good value substitute to the name brands. The anti jam works pretty well at preventing them from sticking together. The metal is durable and we havent had any issues. When they say that this full size standard weight stainless steel steam table / hotel pan says it's anti-jam, they are right! This is a great product! I have several of these steam table pans and they work well for what they were purchased for, cooking roast and pasta dishes in. However, they are a bit difficult to get completely cleaned, they spot a bit. These pans are working very well. They do not jam and are light enough to move around, but sturdy enough to hold all the contents. These are good for the price and the anti jam feature has worked well so far for us. When they come though, they look thinner and not of good quality. They are of decent quality. Does the job. A perfect size pan if you have a warmer that only allows for a four inch depth pan. I can also store hot or colds with ease, so versatile. This pans are a great buy. Very well finished. They will double our cooking capacity at the church over the 2-1/2 inch pans we are now using. These are fine. The metal is thin. A couple of my dish washers have received mild cuts from the edge, but they are a good value and serve their purpose. Thank you for your review! These pans are an excellent value. If you are unhappy with your purchase, please feel free to contact a Customer Solutions Representative. If you are looking for an upgraded pan, check out the Vollrath Super Pan V 30042 full size anti-jam steam table / hotel pan instead! My 4" deep pans were exactly what I was looking for. They are made of quality metal and don't rust or get bent easily. They are perfect for use at large parties. Very deep pan can hold large amounts of food, we even use this pan in the oven and it works very well, the price is great too. This product is as expected and the price point is also excellent. We have been very pleased so far in quality of the product. We definitely recommend this product. This is definitely on the lower quality inexpensive end of the spectrum. And yet, it is meeting our needs perfectly! Will purchase this product again. Can't beat the price. I have ordered several of these as well. The keep my food separate from other items, the stainless steel cleans well, and in the refrigerator, the stainless steel help with uniform temperatures, maintaining a cool even temperature. I could always use more of these. Even use them in my NEMCO food warmer. The 4" full size steam table pan is sturdy and seems to be of very good quality. The two nice things are the price and the anti-jam side. the pans are nice. i Use them with my chafing racks and with the anti jam rim, it allows my to put two 4" pans on top of each other to use together and still have room for water to steam. This is a perfect size pan for a steam table. We use several of these and they are easy to clean and very durable. Would recommend this to everyone. PRICED THIS SAME PRODUCT AT SAMS CLUB.THEY HAD A SMALLER PAN FOR THE SAM PRICE.WHAT A GREAT BARGIN AND IT ARRIVED VERY FAST.I WILL CERTAINLY USE THIS WEBSITE AGAIN. It seems like you can never have enough pans these are high quality pans. They are very durable, they stack nice and are priced well. they came in very nice shape and made of heavy metal. they are very good quality and meet our commercial needs. i will recommend it! This is a sturdy yet not heavy pan. Heat transfer is fast and even allowing quick even heating and holding of my hot foods. I use them for all sorts of dishes from baked chicken to macaroni and cheese. Pan goes from oven straight to my hot holding table. Good pan. We use it to hold cooked shrimp and french fries, and put in a bottom screen to keep the shrimp and fries off the bottom of the pan.Does what it's supposed to do. Easy to clean. Will purchase another when needed. From cooking a whole roast or maintaining vegetables in on a buffet this pan has many uses. It withstands oven heat and direct heat from a sterno. These pans are very high quality, and are the perfect size - they JUST fit inside my household oven, so I can take full advantage of my somewhat limited space. there are times when the two inch pans that come with your chaffers just aren't deep enough for what you want to serve and if the food is acidic you don't want to use aluminum these fit the bill perfectly. For the money, these are the best pans on the market. Great value. You can't afford not to have a bunch extra on hand for convenience. Very nice quality pans! We are using this pan as an insert in our chaffing dishes, very durable and dependable. They are able to endure the heat from the fuel which is very important. I ordered 48 of these steel pans and received them within a couple of days. The pans were of excellent quality and at a great price. I absolutely recommend this product to any restaurant, catering service or for just home use. A great product for the price. Looked around a lot before I bought, and I am sure this is the best price around. Will buy more products in the future.